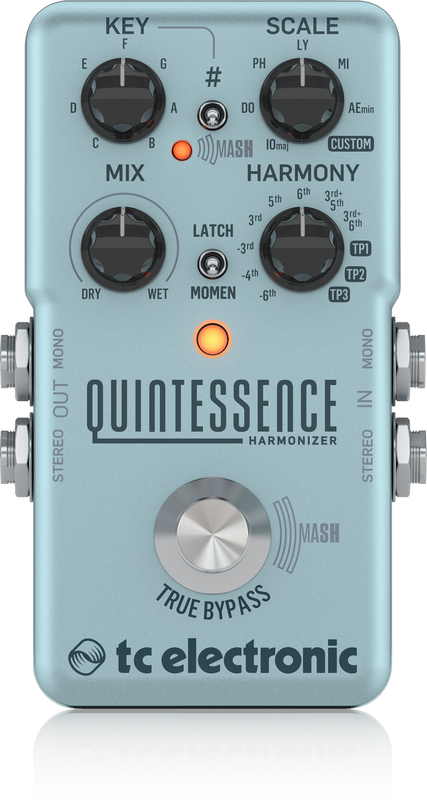 The TC Electronic Quintessence harmony pedal is capable of some serious sonic movement. It generates intelligent two-voice harmonies over your playing, with full creative control offered by TC’s TonePrint app for creating your own custom settings. And that’s just the start. Equipped with a MASH expressive footswitch, you can bend the harmony voices up or down in real-time for subtle or extreme effects. And its analog-dry-through signal path ensures your core tone maintains its sonic integrity. Whether you’re chasing classic harmonized guitar tones, or the potential to create something completely new, check out the TC Electronic Quintessence harmony generator. Two-voice harmony effects pedal for guitar.